Cork is so expensive...very cool..but I don't think I would wear these that often anyway. Someone will definitely be cool in these. A very amazing shoe. The cheaper one..looks just as good. You find the cutest shoes! Everytime I see a nice pair of cork wedges I always think of you. I love the double strap... but that price. ouch! LOVE!!!! I want these to rock with jeans. The color is perfect. I like I actually prefer the Rosegold pair. The chunkier heel is probably super comfy! im actually liking the cheaper ones better! i slightly prefer the rosegold pair!! I actually like the cheaper ones, the double straps on the top seem a little too much for me personally (chubby legs :P). Love the shoes by Chloe! Always on the cheap. I like the style. OMG I am in love with the Chloe ones. They are beautiful! It is a bog price difference with the Rosegold ones but I think I would save my pennies for the Chloe. I really like the Rosegold Pana Suede Sandals. The color is so much cuter and I really like that the straps is lower. I hope you have a good Tuesday, E.
even though they are more expensive i think i like the chloe ones better. love the double belt look. Reminds me of my Biba strappy sandals. Btw I love them! I LOVE cork bottom sandals...you picked gorgeous ones for this post! I'm gonna save a little scratch and opt for the Rosegold, though :)! 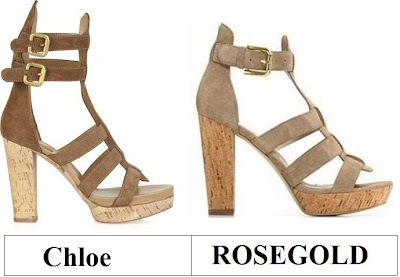 I have to go with the color and double strap of the Chloe ones! Those Chloe ones look pretty incredible. I love the heel and the height of the shoe. I think I prefer the Rosegold version. So pretty! I like the Chloe shoes best... Chloe is one of my favourite labels anyway. If the price tag wouldn't be so hefty, they would be mine! I really like the Rosegold ones lighter color, and one strap. I love those rosegold ones!! Ooh great find! Love both of them though! Wow, great find! They're both so cute, and even though I usually don't like cork, they both pull it off so well! I'd totally love to say I'd go for the cheaper Rosegold ones (especially since I'm flat broke right now), but unfortunately, I'm a bit too much of a brandwhore. Chloe all the wayyyy! I love the Chloe pair. I always covet their shoes. Wow they literally look so much alike! Love them! love the rosegold pair. adorable! I definitely prefer the second pair and think they will suit my short legs better too. Oh this is hard. I love both pair, although the rosegold pair would be easier on the pocketbook! Great find Erika! great find! I love the Chloe ones! I prefer the Chloe pair, the double strap and the thinner heel make it look a bit more elegant and less clunky. The price tag is a bit insane though! I love Chloe ones.....they are perfect for fabulous summer! Gah! I may have to get the Rosegold ones! Love the cork heel. Though I do like the Chloe brown, Rosegold all the way!